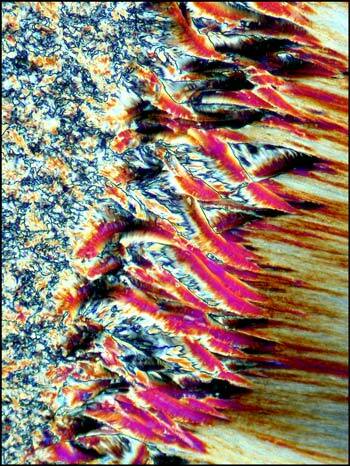 A Gallery of Hippuric Acid Photomicrographs (using polarized light). 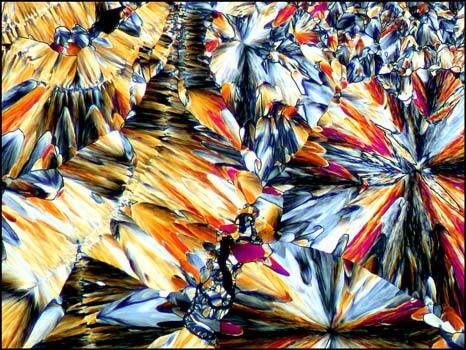 In the history of polarized light microscopy, one of the most popular chemical compounds studied was hippuric acid. 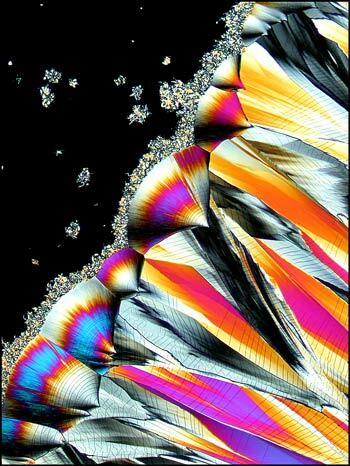 The colourful and unusual displays of melt specimens of this substance have entertained microscopists since its structure was first determined by Liebig in the nineteenth century. One of the first sources was the urine of horses, and the name was derived from the Greek word for horse, "hippos", combined with the Latin "urina", meaning urine. 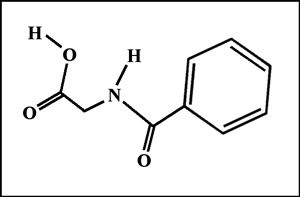 Humans produce very small amounts of this compound when benzoic acid, found in many foods, is rendered less toxic by conversion to hippuric acid. The process of converting a harmful substance to a less harmful one, by the body, is sometimes called the "detoxification" of a compound. The hippuric acid produced in this way is present in the blood and in urine which is eventually passed from the body. It is interesting to note that another more toxic chemical, the solvent toluene, is also partially converted by the body into hippuric acid. Doctors often use the amount of hippuric acid in the blood or urine to determine whether a patient has been "sniffing" glue, which often contains toluene. 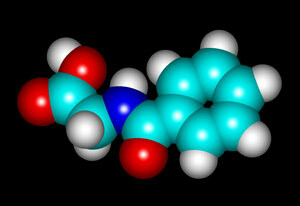 Higher than normal amounts of hippuric acid indicate that the individual may be a substance abuser. 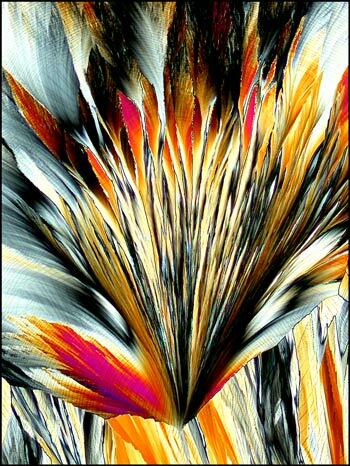 Hippuric acid is a white crystalline substance with a melting temperature of about 190 degrees Celsius. It is easy to produce a melt specimen by placing a few crystals on a slide and covering with a cover glass. An alcohol lamp may be used to heat the slide gently until the melted compound flows to fill the space between slide and cover slip. In this article, all of the photomicrographs were taken with the polarizer and analyser in the "crossed" or "extinction" position, resulting in a black background if no crystals are present. Although many visual patterns result from the resolidification of the melt, there are three that I would like to illustrate in this article. (a) circular growths called "spheroliths"
The most interesting feature present in some melt specimens is a circular pattern (or "spherolith") that results from a site that enables growth being present on the slide. From long experience, I have found that immaculately clean slides usually don't produce this form. It seems that microscopic imperfections in the glass surface, or small specks of dust, must act as the starting point for crystal growth. Evidence for this is the fact that if a slide is reheated several times, spheroliths tend to reform at the same locations, although the actual shape is different each time. 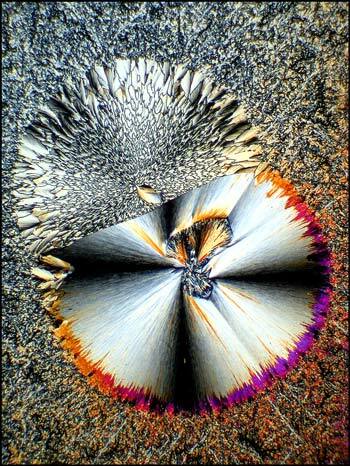 In each of the two photomicrographs below, the spherolith is particularly complex, having a two-part structure. More common is the simpler structure shown in each of the images below. 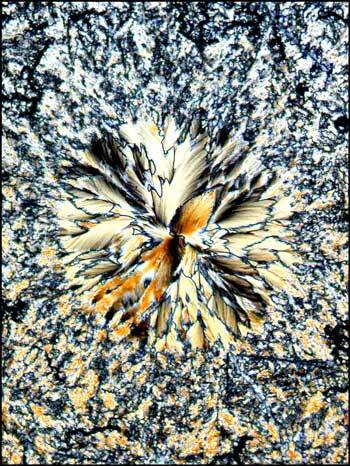 In most cases, the spherolith grows quite quickly over a period of minutes to several hours. 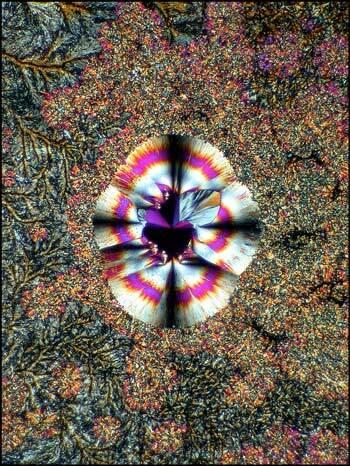 The surrounding more amorphous crystals grow slowly, and can take many days or weeks to completely fill in. Why the spherolith stops forming, and why the surrounding matrix starts forming, is not evident. 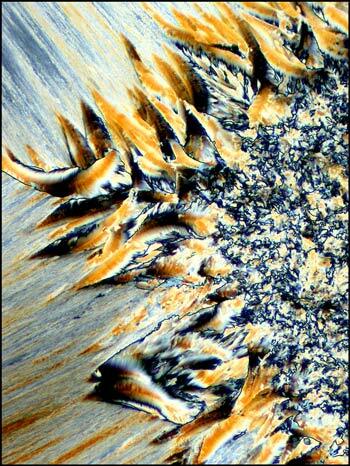 In the photomicrograph below, the spherolith has been captured at the point where its growth has stopped and the surrounding matrix has just begun forming. 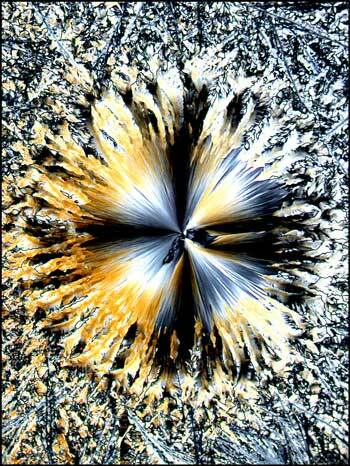 The second characteristic formation in melt specimens of hippuric acid is the "fan" shaped growth. These fans of crystals start at the edges of the cover glass and grow in towards the center. Depending on the thickness of the crystals between slide and cover glass, the resultant forms may be grey, or as in the examples below, brilliantly coloured. A close-up look at the edge of one of the fans shows the fine tracery and branching of the crystal pattern. Another close-up of a fan shows the jagged banded pattern that is sometimes observed. 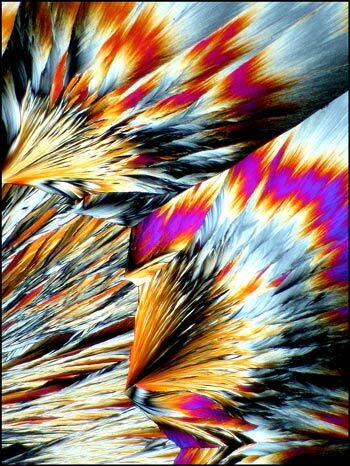 For the final image in the article, I have chosen the photomicrograph below, because it is so unlike all of the other hippuric acid examples. 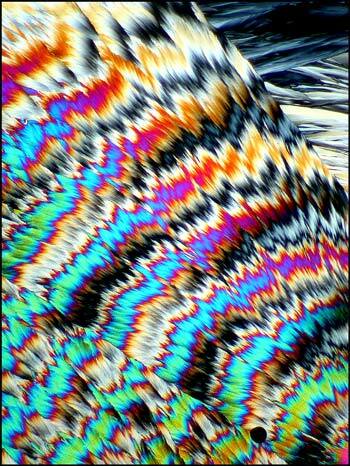 Just when one is confident in identifying this compound under polarized light, up pops the devil! 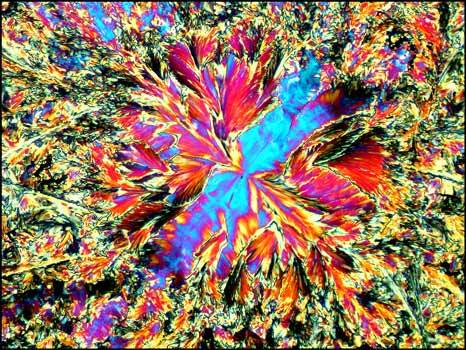 This unusual pattern, that reminds me of liquid crystal melt specimens, is in fact, hippuric acid. 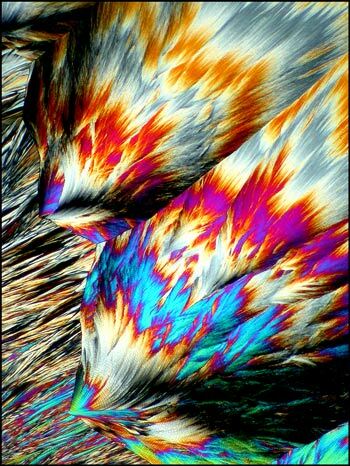 It is this never knowing what to expect next, that makes the photomicrography of crystals such an exciting field of study! 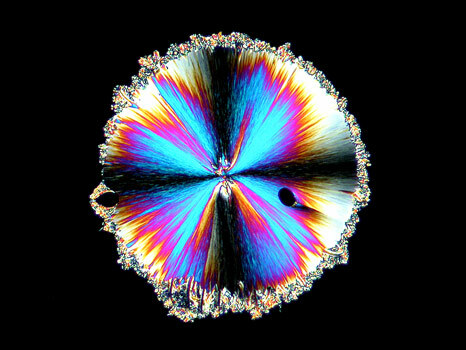 I hope that the images of hippuric acid in this article will entice you to have a closer look at this fascinating compound! When attempting to produce useable melt specimens of any chemical compound, the most important factor is patience. If at first you don't succeed, keep trying! Perhaps only one in five slides will be useable. In some, the crystal layer will be too thick or thin. 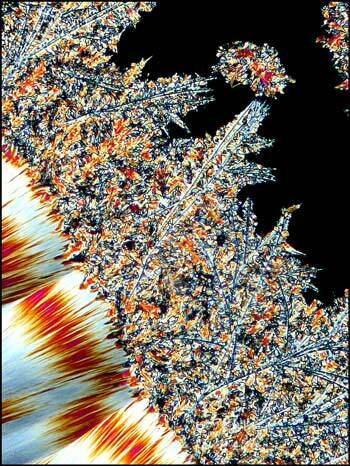 In others, no interesting crystal formations will grow. Experimentation is an important part of the hobby, and your successes will grow as your experience increases. Hippuric acid may irritate eyes and skin, so appropriate precautions should be taken. Slide preparation should be accomplished only under well ventilated conditions! All photomicrographs in the article were taken using a Leitz SM-Pol microscope equipped with a Nikon Coolpix 4500 digital camera. All comments to the author Brian Johnston are welcomed. 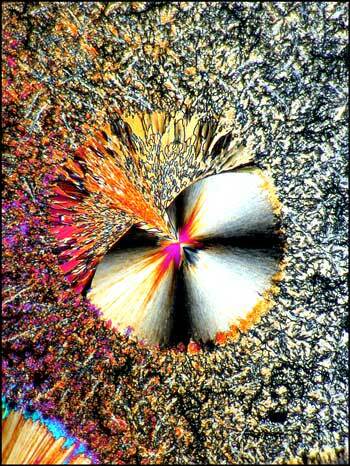 © Microscopy UK or their contributors. Published in the November 2003 edition of Micscape. Please report any Web problems or offer general comments to the Micscape Editor. 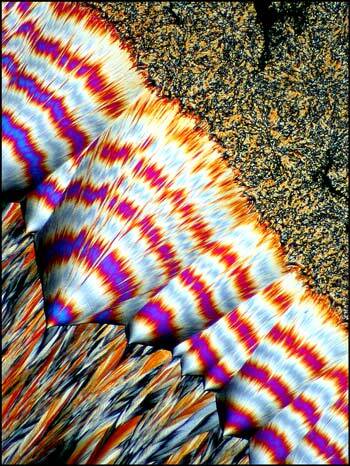 © Onview.net Ltd, Microscopy-UK, and all contributors 1995 onwards. All rights reserved. 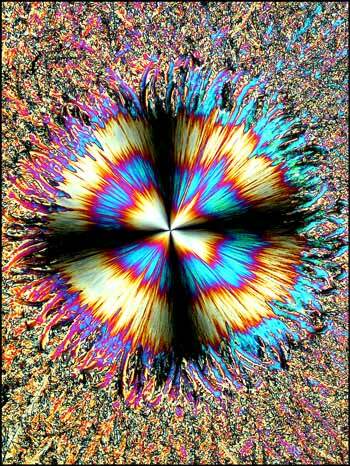 Main site is at www.microscopy-uk.org.uk with full mirror at www.microscopy-uk.net.